In the last few years, pension funding levels and 401(k) account balances have fallen dramatically. New disclosure rules, volatile market conditions, investment complexity and mandatory cash contributions are only a few of the many challenges that are unlikely to go away. 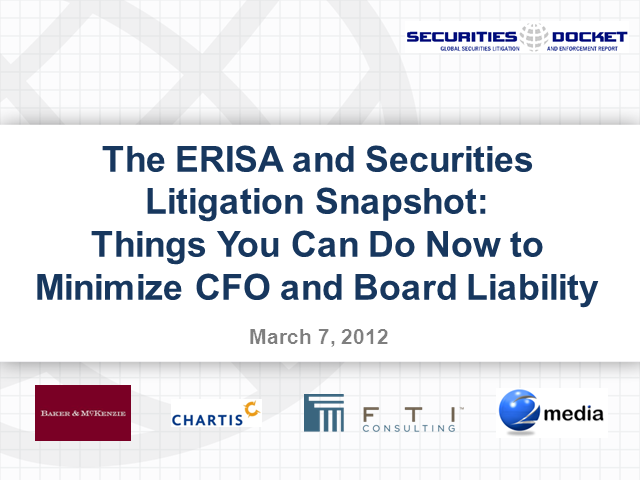 Not surprisingly, ERISA litigation continues to grow, along with lawsuits related to employee benefit plan governance. Personal liability claims against C-level executives and board members has become the normal. Join FTI Consulting and the Securities Docket for a timely and informative webinar about the link between employee benefit plan management and shareholder value. The panel includes (a) Attorney Jim Baker, ERISA litigator of the year for 2012 and a partner with Baker & McKenzie (b) Ms. Rhonda Prussack, Executive Vice President and fiduciary liability insurance product manager for Chartis (c) Mr. Gerry Czarnecki, governance guru and State Farm Insurance board member and (d) Dr. Susan Mangiero, Managing Director with FTI Consulting’s Forensic and Litigation Consulting Practice in New York.